Once again the Highlands Pedalers will host the Tour of Sebring over Labor Day weekend in sunny Sebring. Join us for three days of cycling on scenic and quiet central Florida roads. We will offer multiple routes each day to satisfy the needs and wants of any rider ranging from beginner or casual cyclists all the way to those seeking a distance or pace challenge. 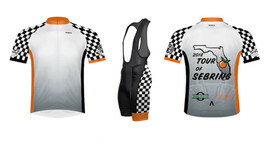 We would love to have you join us in the fun and camaraderie that is Tour of Sebring. Please note that unlike years past there will be a separate option to purchase meal tickets. Meals will be available on all three days and you will need to purchase tickets per meal/per person as needed. Event jerseys and bibs are available at www.memberplanet.com/s/highlandspedalers/tos18kitorder till 7/11/18 for pick-up at event. Please note that T-Shirts will not be guaranteed for day-off or late registrations. We will order extra's but might run out of your size since we have to order from our supplier by the cut-off date.